Day trips often go here as its only 4 miles to the “blue water” and your fishing is on. The trolling, is mostly some “mackerel” fishing on the inside and/or some “tuna”, Kingfish, Mahi Mahi or even an occasional sailfish or wahoo on the edge of the reef. All these fish are seasonal and we will advise what’s hitting at your requested time. Reef fishing is good out front, better a little West and best a lot West. Remember even in Key West there not all big ones, sometimes you get disappointed however, not often. We troll our way to some good bottom fishing grounds (catching whatever is seasonal) and anchor up for night action. You can expect a “yellowtail snapper” bite, along with some grouper (when in season), Mutton snapper, mangrove snapper, triggers, and late in the night the “bluefish” often find us and “the bite “is on. On the larger side we regularly catch “king Mackerel” 20-60#s and to some folks pleasure and others displeasure, sharks of all sizes (some just too big to mess with). Typically we work the blue water and the edge, but occasionally we work close in and sometimes hide out from the weather and fish behind the “Marquesas”. 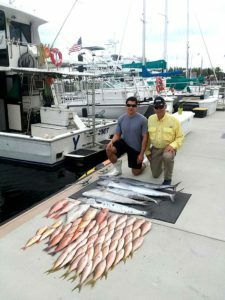 The fishing is good “out front”, better West to “the marquesas” and best on West to “Rebecca shoal” and even further to “The Dry Tortugas National Park” area. These trips take a minimum of 3 days. 2 days can get you around the “Marquesas” area and 1 night and day can get you “out front”. Your seafood meals will be fantastic and there will be plenty of fish to go around. We seldom trip East. Key West is at the end of the road and to go back toward populated areas just doesn’t make good sense. Occasionally we hear of a good bite to the East or sometimes on a 1 night trip we have some nice reefs that produce, but West is the best. Our plotter is filled with good bottom spots from Key West to the Dry Tortugas and there is still a multitude of “good” spots yet to be discovered. If you want a great ocean experience with a Captain that enjoys helping you catch your “fish of a lifetime”, YKNOT is your boat.